Great casa - 6th floor of a building right on the Malecon so stunning views across the water from the breakfast room and one of the guest rooms. Neighbourhood may look dodgy at first, but this is real Havana - very safe but largely residential. 10 minute walk to the old town. A real experience - have stayed here twice and would stay again. Okay, when you arrive in front of the building you might be scared but once you reach the 6th floor via a very slow and old lift you will find a little place of paradise with an amazing view on the Malecon. The rooms are all very nice, with all the confort you can dream of! The aircon works perfectly and the furnitures in the room are just amazing if you like 20's-30's style. You will be welcome by the very friendly owner that will help you with whatever you could need. The casa is ideally located on the Malecon and you can walk wishing 15-30min to Old Havana! 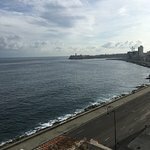 I really enjoyed my stay there and if I ever go back to Havana, I will definitely stay again in this casa! 3) maybe the toilet works, maybe not. On our fourth night it stopped working so I had to fill the garbage can with water from the bathtub (shower was not working) and dump it into the bowl. And the can took a while to fill because there was almost no water pressure. 6) the bidet was leaking water all over the floor. The bidet never worked anyway because there was hardly ever any water pressure. 7) the shower wasn't working because the hot/cold knob wouldn't turn. "We can fix it tomorrow" were were told. It was never fixed. I can't believe the other reviews are of the same place; it appears since those reviews were written the place has gone downhill fast. We stayed at much nicer Casas than this one; skip it if you don't want to be stuck in a room where so many amenities are broken. The owner doesn't seem to care about basic maintenance. The number of problems we had was quite amazing. On the positive side, the A/C worked well, and there was a fridge that worked too. Also, most of the power outlets worked. Room tip: If you are shown to your room and something doesn't work, let them know right away, they might move you. When we arrived, we almost thought it was a joke as the blocks almost look like it's a war zone. The streets and pavements are gone, there are holes everywhere, road works so it's noisy and smelly. It loooks terrible. Fortunately once you're inside the building, the rooms are nice, the breakfast is great and the noise stops, The only downside was that we never had any hot water. We booked 3 nights here through cubabookingroom.com at a price of 40 CUC per night. Our room was overlooking the Centro Habana area (it's 5 CUC extra for a sea view) and we stayed on the 6th floor. Like some of the reviews have mentioned the entrance is unassuming and crumbling in a Havana-like way. Don't let this & the rickety elevator put you off! The casa is secure and has a number of rooms and social areas situated off a cool corridor which runs from the street to the sea view/malecon side of the building. The staff were friendly, breakfast was tasty & can be eaten in the front room looking out to sea and the malecon. The room was also very good - spotlessly clean, modern, quiet air-con & decent shower with hot water. 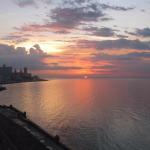 We also loved the view from our balcony over the city, equally as impressive as the view of the malecon from the front! We found it took 15-20mins to walk into the old town, we enjoyed the walk & it was a great way to explore Centro Habana which most people don't see! All in all we had a fantastic stay here and returned at the end of our trip to Cuba as well, both times the casa helped organise a taxi to/from the airport.